At St. Elizabeth’s, our expert multidisciplinary hepato-pancreato-biliary (HPB) cancer care team strives to ensure the best outcomes for patients. In partnership with Dana-Farber Cancer Institute and led by world-renowned surgical oncologist Claudius Conrad, MD, PhD, FACS, St. Elizabeth’s highly skilled HPB team provides cutting-edge surgical treatment and seamlessly coordinated care for the best possible outcomes for our patients. Dr. Conrad works closely with a multidisciplinary care team, which includes medical oncologists, interventional radiologists, radiologists, nutritionists, and nurses, to develop individualized treatment plans for patients and their families. Dr. Conrad is the chief of General Surgery and Surgical Oncology, and director of Hepato-Pancreato-Biliary Surgery at St. Elizabeth’s Medical Center. In this role, he brings his expertise in the treatment of hepato-pancreato-biliary cancers to patients throughout the Steward Health Care system. Prior to joining St. Elizabeth’s medical staff, Dr. Conrad worked at MD Anderson Cancer Center in Houston, Texas. He earned his medical degree at the University of Munich and Harvard Medical School, after which he completed a residency in general surgery at Massachusetts General Hospital in Boston followed by fellowships at Dana-Farber/Partners CancerCare, the Institut Mutualist Montsouris in Paris and University of Tokyo. 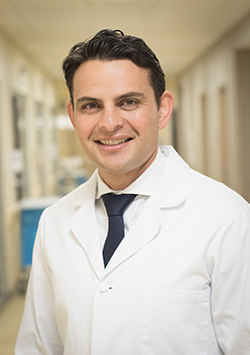 Board certified in general surgery and general complex surgical oncology as well as fellowship trained in minimally invasive hepato-pancreato-biliary surgery, Dr. Conrad also brings a robust research program to facilitate clinical innovations, specifically in understanding cancer biology and using music to complement holistic healing of patients. As a classically trained and accomplished concert pianist, he co-founded the field of clinical research on the science of music in medicine.